From time to time, you hear someone refer to "pear cider." Given that many American ciders are now made with other fruit, I suppose you could say that a cider made with some portion of pear juice is a pear cider. 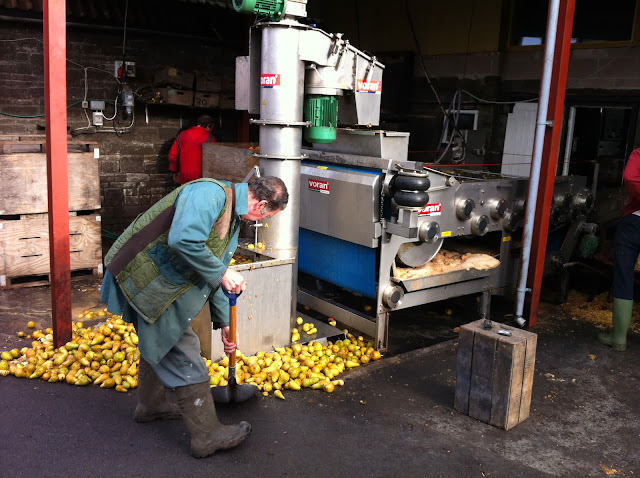 But the stuff made wholly from pear juice: that's perry (or, in France, poire). Like apples, perry pears (they're always called "perry pears," never just pears) are grown because they contain the sugars, acids, and especially tannins that make a good perry. Because of their rarity at home, I have rarely even had them. That was rectified in my swing through England, because the cideries all had more than one available. They're more rare in Normandy, but still roaming about. In fact that Calvados you love may well contain a small amount of pear. Perries are the red-headed step-children in the cider world--neglected and misunderstood, an afterthought. But some cider makers are devoted to them and produce beverages as elegant and complex as cider. Indeed, Tom Oliver recently won best in show for a perry at a national contest where they were outnumbered by ciders three to one. Oliver's perries are elegant and finely-wrought little creatures, characteristic as much for their pillowy softness as their flavor. I noticed it on our first pour, of the Draft Perry. The word that sprang into mind was "meringue"--both for the bright flavors and mousse-like texture. Red Pear Cocktail perry had a poached pear flavor and light delicacy. (Both completely concealed their alcohol spines.) By contrast the bottle-conditioned medium had tons of tannin, a bit of herb in the nose, and a touch of blue cheese. It reminded me more of Mike Johnson's perries at Ross-on-Wye; those have a sturdier farmhouse quality, with burnished tannins (they seem softer in pears than apples), more alcohol warmth, and a hint of wild yeast. Those who love smacking tannins found in English ciders would approve of them. Norman poire is to perry what Norman cidre is to English scrumpy--a lighter, sweeter, bubblier tipple. Pears naturally tend toward sweetness, not only in sugar content but pear flavor. In Normandy, where the philosophy is sweet and effervescent, they can seem almost evanescent in the mouth. I was surprised to find, however, that in a side-by-side pairing with different courses, the poire consistently matched and usually exceeded its counterpart, a cider. There's an adage among orchardists: "pears for your heirs." Perry pear trees take a long time to begin producing (15 years), and even then they are harder to harvest. Cider makers say perry is harder to make, too; the flavors are more subtle and fermentation is for some reason more finicky. This may account for the reason there are fewer perries on the market--and I despair that perry pears will ever grow in our neck of the woods. (Though, positive note: in England perry is now so popular that they're putting in acres of new fruit.) But they are worth trying to track down. They are not just a curiosity, but a wonderful beverage in their own right.